The Pros and Cons of Each System and 3 Common Variations. If you aren’t familiar with the term or system of hydroponics, you've landed in the right place. Here you'ill find simple, easy to use information that I have been putting together since I began my foray into hydroponics. Simply put, it is the process of growing plants without soil. Plants are grown in a water-based, nutrient solution or a sterile growing medium. Both ways ensure optimal delivery of nutrients to roots. The sterile growing medium allows for the nutrients to be absorbed precisely, ensuring optimal growth. Plant root systems endure less stress when grown in these environments as they no longer need to seek out food from soil, converting nutrients into energy faster. This results in higher yields over shorter times. You control the supply of nutrients via a liquid solution and adjust the pH of the water for optimal growth. You can choose to use organic or non-organic nutrients. At the end of the day, with hydroponics, you are not concerned with the health of soil so either choice leads to the same results. "The choice to use organic or non-organic nutrients is a personal and ethical one rather than a right or wrong way." The purpose of a hydroponic system is to deliver to the plant its three essential needs, namely light, water and nutrients. In ideal conditions, where these three needs are met, plants will grow to be strong and healthy, producing a high yield. In conditions where these three needs are not in perfect balance the plant and the yield suffers, producing poor quality fruit and weak plants. There are benefits and drawbacks to growing hydroponically, so before choosing your system ask yourself some questions. Do I want to grow for myself or commercially? What plants do I want to grow; food, flowers or medicinals? How much time am I willing to give on a daily basis? Starting on a small scale for pleasure is easy, rewarding, affordable and FUN! With hydroponics you can create the perfect conditions for your plants. When plants are grown without soil there is less stress on the root system to search out nutrients as the system supplies all this directly. The plant spends less time converting minerals and nutrients to energy so the plant grows faster and bigger. This results in higher yields in a shorter period of time. The initial set up can be costly if you're trying to grow commercially and lack of experience can often mean your first few attempts may not be completely successful. But as with everything in life, perseverance furthers and anyone who has a passion for anything always has success in the end. The other main drawback is that because you're creating the environment, you are the one that will determine how well the plants grow, this means you need to spend the time, especially in the beginning, checking nutrient levels, pH and moisture content. You need to make sure the system of your choice runs smoothly as any kind of set back, like a pump not running or roots drying out, could mean loss of stock. How Hydroponic Systems Work ? Plants are grown without soil to maximize nutrient absorption. This means the delivery system of nutrients is very important. A system can be classed as active or passive. Active means the nutrients are supplied via a pump. Passive means no moving parts or electricity is needed. Variations on these systems mean sometimes a passive system will incorporate a pump, although traditionally this is not common. The other aspect of a system is characterized by the recovery or non-recovery of nutrients. Some systems use the nutrient solution only once and it is then discarded. The recovery system entails the recirculation of nutrient solution. Although non-recovery is more cost effective it can be detrimental if growing on a large scale as hygiene is compromised. 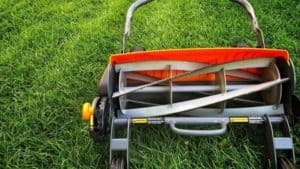 Before deciding what system you want, consider how much money you want to spend, what plants you want to grow and the level of your experience. Trays/Containers with lids/Net Pots etc. Check out the information on all 6 hydroponic systems so you can make the right choice for your specific needs and wants. 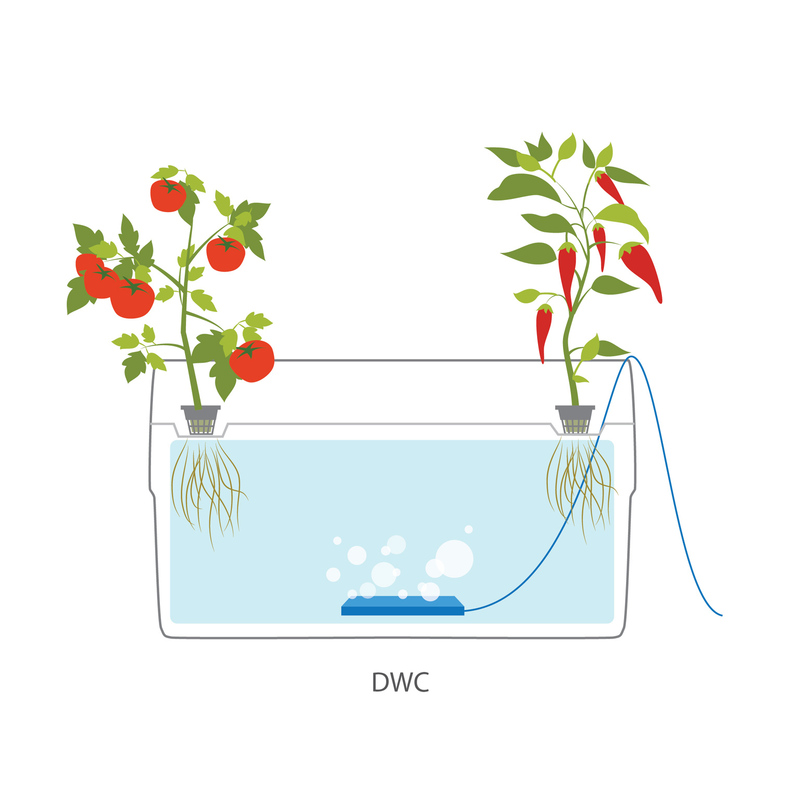 What is a Deep Water Culture (DWC)? The water culture system is the simplest of all active systems. Many small plants can be placed on a tray, made of polystyrene, which floats on top of the nutrient solution held in a reservoir or tub. The roots are submerged in water. Alternatively, plants can be placed in net pots and fitted into a lid that fits the reservoir/tank/tub. The water is kept oxygenated with the use of an air stone which is connected to an air pump via an air hose or tube. This ensures the plant’s root system does not become waterlogged which would lead to rotting and an inability to absorb nutrients. Plants that benefit the most from this system are salad greens like lettuces, rocket, endives, Asian greens etc. This system is sometimes referred to as Deep Water Culture or Aquaponics but in essence they are all water culture systems. What You need to start Deep Water Culture System ? The Wick System is traditionally a passive system. This means there are no moving parts and no electricity is needed, making it perfect for beginners and people on a tight budget. It is the simplest of all hydroponic systems. How it works is that the plant receives its nutrients via a wick which connects the plant to the reservoir and soaks up the nutrient solution. The growing medium absorbs the nutrients and the roots are fed. Larger plants with higher nutrient requirements won’t fair well with this system as they may use up moisture faster than can be supplied via wick. Nutrients can be unevenly absorbed and over time the salt levels may build up in the growing medium. Not the easiest method of controlling moisture content. What You Need To Start Wick System ? How Exactly Does Drip Irrigation Work? This is the most popular of hydroponic systems. The nutrients are transported from the reservoir through a tube to an irrigation pipe that waters the plant at the base. Drip irrigation can be recovery or non-recovery. Commercial growers tend to favour non-recovery and home growers, recovery. With a recovery system a timer is used to control the pump that supplies the drip lines. The solution then flows back into the reservoir. This system is cost effective but nutrient levels may be more inconsistent and a build up of salts in the growing medium means more maintenance. With non-recovery the cost of nutrients is higher, as the solution is used once and drains off, but the advantage is that the pH is regulated and maintenance is less time consuming. Timers can be set precisely and left until more solution is needed. What You Need To Start drip irrigation system ? The Ebb and Flow System is more complicated and advanced than other systems. Here the plants are placed in a grow tray in their growing medium and placed on top of a reservoir. The system is operated with a scheduled timer that allows the pump to switch on and fill the grow tray with the nutrient solution from the reservoir at regular intervals. The tray is flooded and the timer switches off. The nutrient solution then drains off. This system is either set up as a recovery or non-recovery system, meaning the solution can be used once or recycled and used again. Plants are not fully submerged allowing good aeration and good nutrient absorption at regular intervals. Plants are not directly connected to the reservoir so more plants can be grown on a platform much larger than the reservoir. If growing indoors the temperature can be more efficiently controlled with this system as the reservoir is separated from growing trays. Slightly more experience is needed with this system to ensure nutrients and pH levels are kept constant and that the medium doesn’t get clogged with salts from the nutrient solution. Disruptions of power supply could affect timers and pumps, leading to dry roots. This can be solved by choosing growing mediums that absorb and retain moisture efficiently. Plants are grown in tubes called gullies. Alternatively, grow tanks are used to increase the space needed for root growth. The grow tray or gully is placed at a slight angle above the reservoir and ideally a channel in the centre of the grow tray is needed to help drain solution more efficiently. The need for a timer is eliminated as the pump supplies a constant flow of nutrients over the roots. Plants are placed in net pots and no growing medium is required. The reservoir is kept aerated by means of an air pump attached to an air stone. This keeps the nutrient solution from settling and also supplies the roots with oxygen that help with nutrient absorption, meaning less energy is used by plant to feed and more energy is used to grow. A submersible pump in the reservoir sends a constant supply of nutrient to the grow tray. A gap between plants and water guarantees aeration. The water is drained off back into reservoir. You can see how this system is an improvement on the Drip System’s recovery method. Cost effective as nutrient solution is recovered and recycled and growing medium is generally absent. If power supply is interrupted roots will dry out quickly in the absence of growing medium. Maintenance is higher as one needs to keep checking that the pumps are running continuously. What You Need To Start N.F.T System ? This is the last kid on the block. The most technical and latest of all the systems to be implemented by hydroponic enthusiasts. It works on an automated time system. Just like the N.F.T system it needs no growing medium. With this system the roots are suspended in air and a mist is applied every few minutes. Very efficient and cost effective after initial set up. Saves on water, nutrients and growing medium. Pump and timers need to be checked regularly, making it high maintenance. Drying out of roots at the slightest interruption is even more severe than with the N.F.T system. What You Need To Start Aeroponics System ? A variation is just a combination or a modification of these 6 basic systems. There can be hundreds of combination/variations. Here are 3 of the most common advance variations. This is a variation/combination on the Wick System and Water Culture System. It is a passive, non circulating system. A reservoir with a tight fitting lid, holds the nutrient solution. The plant and growing medium is put into a net pot. A hole is cut out of the lid and the pot is fitted into it. The roots will initially be submerged in the solution with only a small air gap available between the inside of lid and nutrient solution. The system can then be left alone. As the nutrients get absorbed by the growing medium the roots grow, the water level drops and the air space increases. This ensures the plant gets enough oxygen and still receives food. How Dutch Bucket System Works ? 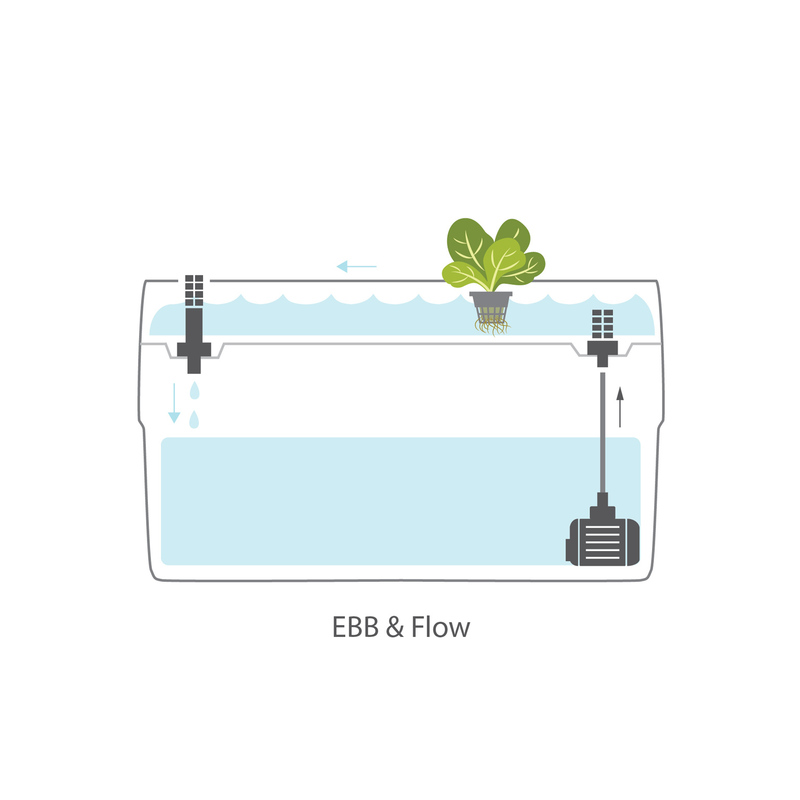 This variation of the Ebb and Flow system uses single buckets placed in rows, with one irrigation line supplying nutrients from above and one drainage pipe below, leading back to the reservoir. This system is ideal for large operations as the single rows can be joined to the same irrigation line easily and accommodates large, fruiting plants. Because each plant has its own bucket it is easy to access and move the individual plants. With this system you want a growing medium that can maintain high levels of moisture and stay well aerated. Good drainage is essential as you want to avoid clogging when nutrients drain back into reservoir. The reservoir is placed below the buckets using gravity to reclaim nutrient solution. Only then is the submersible pump used to feed solution back into feed line connected to individual buckets from above. The nutrients in reservoir are kept oxygenated via air pump and air stone. Maintenance has to be carried out regularly and pH and salt levels need to be checked and kept balanced. Seedlings are started off in coco peat, sphagnum peat or Rockwool, using a water culture system. Once established they can then be transferred from propagation area to the Dutch Bucket system. Light expanded clay aggregate (LECA) is ideal for this system as the large size of pebbles means they can’t get stuck in drain pipe and block the circulation system. Perlite is another good choice. It is light, has excellent drainage, aeration and water retention. Measures must be taken to prevent blockages. Covering the entrance of drainage pipe with mesh will work. Perlite works best when mixed with another medium such as vermiculite. Coconut coir is not the best choice with this system. If using a very absorbent, slow draining medium like coir, it is advisable to go for the Drain to Waste method and instead of flooding, convert to a slow drip/ low volume irrigation format. But this in essence defeats the purpose of the recovery system and increases running costs, as nutrient solutions don’t get recycled. A variation on aeroponics, this system has improved growing results by leaps and bounds. Rather than misting at intervals, a fogger is installed in the reservoir and a humid environment is created. Foggers, or mist makers, decrease the size of the water droplets significantly. Not only do these gravity defying droplets give the root system full nutrient coverage they also stimulate the growth of tiny root hairs, increasing the root systems surface area exponentially. Nutrient solution does not dilute as recirculation is not used. Power outages could wreak havoc if roots dry out. Hydroponics is a sure fire way to get hooked on growing your own plants. There is a system suited to everyone. The availability and choice of products is mind blowing. Happy growing! nice article on building up new webpage. Thank you for the auspicious writeup.